This is the story of twelve-year-old Claudia Kinkaid and her brother Jamie. Claudia decides to run away, taking her little brother along. They go to the Metropolitan Museum of Art (the MET) in New York City, wandering the halls, joining tour groups, and hiding from guards at night. A new statue arrives at the museum that may or may not have been carved by Michelangelo. Claudia and Jamie decide to discover its origin, which leads them to the woman, Mrs. 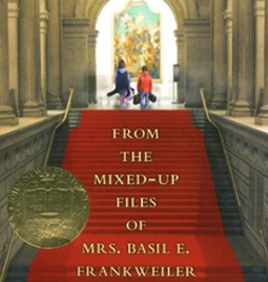 Basil E. Frankweiler, who donated it. They work to discover the statue’s secrets in her mixed-up files.